If you are reading this, you are no doubt one of millions of college students looking for a 2017 summer internship. As most college students know, internships can be an important key to not only gaining more on-the-job-experience in your chosen field but also to give you an edge over other candidates when it comes to looking for your first job. Internships are becoming extremely popular. In some career fields, they are even required. But how do you find the internship that is right for you? Where do you begin? These are very important questions. Searching for the right internship can be a daunting task, very similar to looking for a job. But there is good news. With the right tools, your search can be not only quicker but also producing more precise results. 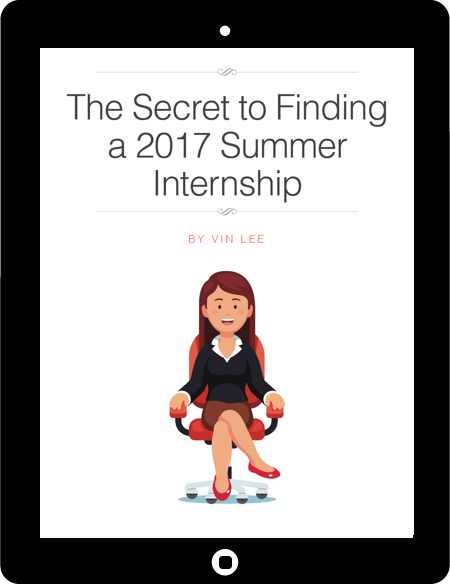 This e-book will teach you the formula to finding the best internships. It will help you clearly define the exact type of internship, in the exact industry, in the exact location you are looking for, before you begin your search. By spending just a few minutes in prep time to create the perfect search string for your Internet search, you will get only the internship results you are really interested in. This e-book teaches you how to use our formula to search for internships on the Internet and will save you time in your job search. Millions of students will be scrambling to grab the best internships, and the competition is often fierce. Knowing how to use the secret formula to ensure you get the best, most precise results with less time will be well worth the time it takes to read our e-book. Our e-book is in electronic format only for ALL mobile/desktop devices/computers for just $1. Download and purchase (secured with your PayPal account or with your debit/credit card as a PayPal guest (which does not require a PayPal account)) today using the "Buy Now" button below. PayPal is NOT required.